We provide significant and consistent financial support to the Library through our bookstore, online and semi-annual book sales. 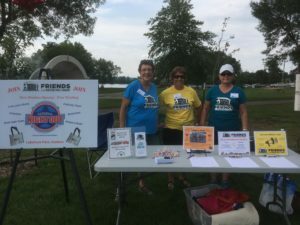 The Friends is involved in many outreach and advocacy projects throughout the Hudson community. 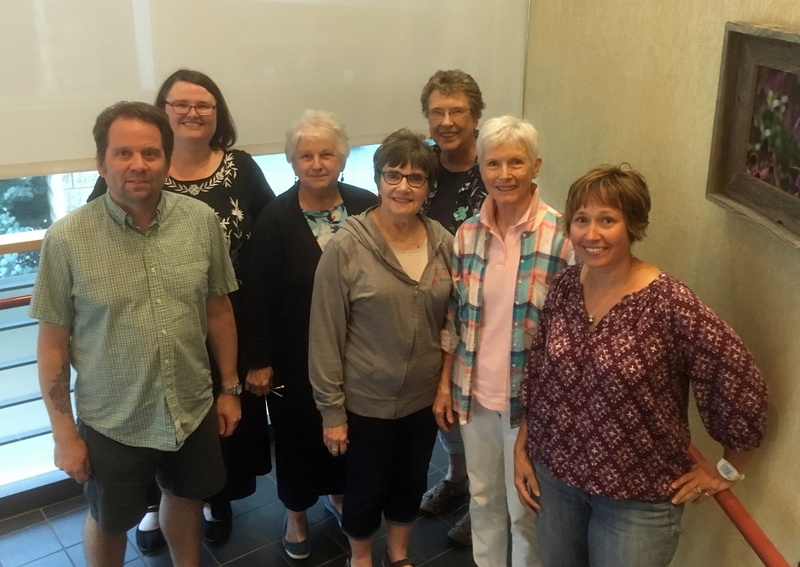 We are also a social organization that fosters a connection to the Library with the aim of providing engaging volunteer opportunities to our members in support of the Library and our community. Browse our website, become a member, and find or create a volunteer opportunity that fits your interests. 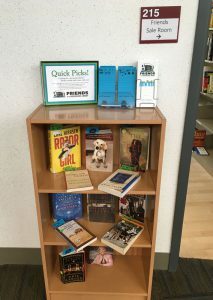 The Friends is a fun and flexible group of community members that shares your interest in books, supporting the Library and connecting with our community. If you have any questions, would like to share ideas, or need assistance, please contact us at hudsonlibraryFRIENDS@gmail.com. 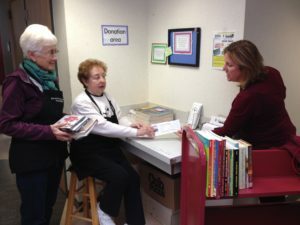 The Friends of the Library Bookstore is maintained entirely by dedicated volunteers and is always open during library hours. Book bargains for all ages can be found in the bookstore located in room 215 upstairs. 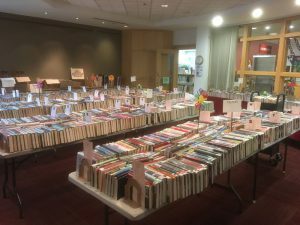 A large and ever-changing selection of genres includes Current & Classic Fiction, Mystery, History, Biography, Children & Young Adult, Animals & Pets, Art & Photography, Automotive & Aviation, Cooking, Sports, Gardening, and many more. We also have an extensive collection of CDs, DVDs, audiobooks, vintage and specialty books. Our low prices begin at $0.50, and most hardcovers range between $2 and $3. You’ll often find a sale of featured genres for half price! 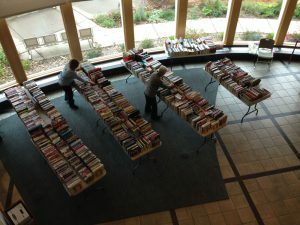 FREE books are offered on the marked shelves outside the bookstore as well as on carts in the front lobby entrance. Please help yourself. No time to browse? Take a look at our QUICK PICKS shelf outside the bookstore for recommended reading with a quick review. Feel free to review any of your favorites you find in the store! Community Outreach activities are another major focal point of the Friends. Join us as we work to increase awareness of the library’s many programs and serve the literacy needs of the community. Support the Hudson Back Pack program by providing the current calendar of library activities and a Book Buck to be used in the Friends Book Store. 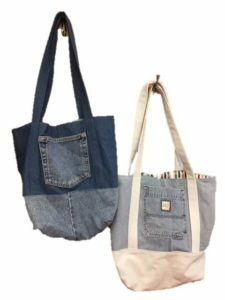 Sew book bags for “Books in Bags for Babies” in partnership with Houlton Elementary and Hudson Hospital. 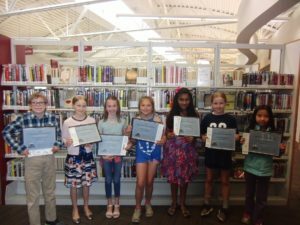 Help with the Friends annual Bookmark Contest for fourth graders in the Hudson School District. Support the summer book mailing program for underserved students at Houlton Elementary. Participate in Literacy Night at Houlton Elementary. To find out more about how you can get involved, or if you have questions or ideas, please contact us at hudsonlibraryFRIENDS@gmail.com. Thank you for considering the Friends of the Hudson Library for your book donations. Your donations of gently used books, textbooks, audiobooks, DVDs, CDs, and current magazines are gratefully accepted and may be dropped off at the circulation desk. Receipts for your donations are available. 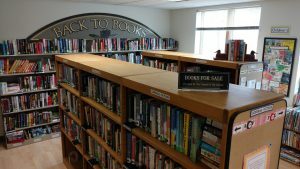 Most donated books are sold in the bookstore or at book sales. 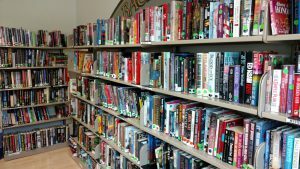 Some are used to expand the Library’s lending collection or to replace worn books. Those of local interest may be placed in the Nancy L. Hawkinson History Room on the second floor of the Library. The children’s reading programs also benefit from books used as prizes. Higher value books are listed for sale online at abebooks.com. We always try to direct books to those in need within our community, and we provide free books to teachers for use in their classrooms. If you know of a worthy recipient or group, please let us know. We are able to accept material that has been inspected by the owner, is in ‘like-new’ resalable condition, and is delivered in clean boxes/bags/totes. Materials must be donated in person at the circulation desk during library hours. Please do not leave donated material in the library book drop box or outside of the library. There are many opportunities to volunteer and support the Library, the Friends and the Hudson community! Don’t worry about your schedule or experience level. We can always find a way for you to help that works for you! The Friends will provide a mentor to show you the ropes and help you decide how you can best share your talents! To find out more about how you can get involved, or if you have any questions, please contact us at hudsonlibraryFRIENDS@gmail.com . You can contribute to the Friends by donating your gently used books, DVDs, CDs, audiobooks, and current magazines. Donations are tax-deductible and donation receipts are provided on the Friends donation table on the second floor and at the circulation desk. Another great way to contribute is to save your Family Fresh grocery store receipts and drop them into the collection jar at the main circulation desk. 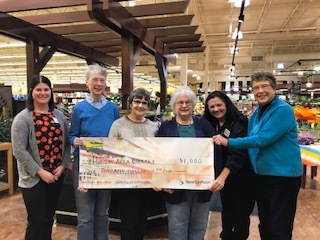 For every $150,000 in receipts, Family Fresh generously donates $1,000 to the Friends of the Library. This money is used to support the Library and its programs. If you have questions about donations or need assistance, please contact our Bookstore Coordinator at hudsonlibraryFRIENDS@gmail.com. New members are warmly welcomed! Join us at a Friends meeting to get to know our members and hear about our current and future activities as well as our goals. Friends meetings are held on most second Thursdays of each month at 5:30 pm in Conference Room 219. See the schedule of upcoming meetings and events on the calendar page. Provide your membership payment online via PayPal. The Friends of the Hudson Area Library is a nonprofit 501(c)3 organization. Your membership and additional amount is tax deductible.